I'm a big fan of sandwiches, especially for people with diabetes. Lean proteins and vegetables on slices of whole grain bread make for a quick and balanced diabetes-friendly meal. But be careful about tuna, chicken and egg salad sandwiches, especially if you're eating out. Most commercially prepared salad sandwich fillers use plenty of full-fat mayonnaise. This pushes the calorie and fat levels sky-high. If you're cooking at home, use just enough reduced-fat or fat-free mayonnaise to hold everything together. If you're eating out, it's probably better to skip the salad sandwiches. You can put the words "taco" and "salad" in the same sentence, but it doesn't make it healthy. Healthy salad meals start with about a two-cup base of leafy greens (the darker the green the better) and are topped with lean proteins, non-starchy vegetables, possibly legumes and a light dressing. Southwestern salads, on the other hand, are often calorie bombs thanks to full-fat cheese, fried meats, heavy dressings, and fried salad toppers. There are healthy ones out there, but this category of "salads" should be a red flag. Smoothies may sound synonymous with health food, but most times they're not. Many retail establishments use smoothie mixes that contain too much added sugar, especially for a person with diabetes. The healthiest smoothies are made with unsweetened fresh or frozen fruit, reduced-fat milk, yogurt, and possibly silken tofu. Low-fat dairy, silken tofu, and even a whey protein powder can help to increase the protein content of a smoothie, making it a well-balanced option. However, even healthy smoothies can provide too much carbohydrate if you make them too big. If you're buying a pre-made smoothie from the grocery store, read the food label and note the recommended portion size. If you're purchasing a fresh smoothie or making one at home, shoot for an 8-12 ounce serving size. 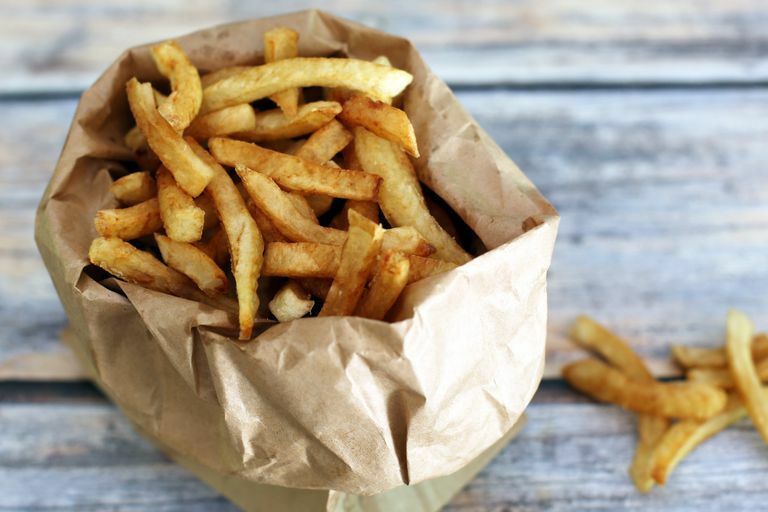 Even though many restaurants now use oils that are trans-fat free, french fries are generally still loaded with fat, calories and sodium. A large portion from a fast food restaurant will usually be about 500-600 calories, 25 grams of fat and 1000 mg of sodium. So instead of fries, opt for a side of fruit or salad instead. There are actually a good number of healthy and tasty microwavable meals available on the market today — Healthy Choice and Lean Cuisine make meal options that are generally low in fat and sodium. However, most frozen pot pies are loaded with fat, calories and sodium. Expect that a frozen pot pie will cost you between 600-1000 calories, anywhere from 30-60 grams of fat and around 1000 mg of sodium.